The EMS program at HFC is very hands-on. So much, in fact, that EMS students use an actual ambulance as part of the basic and advanced EMS labs. “HFC is very fortunate to have such a great ambulance for our EMS students. It was recently redesigned with state-of-the-art equipment and slick new HFC graphics. It looks great,” said Shannon Bruley, HFC EMS program director. The training ambulance is designed as a regular working ambulance. 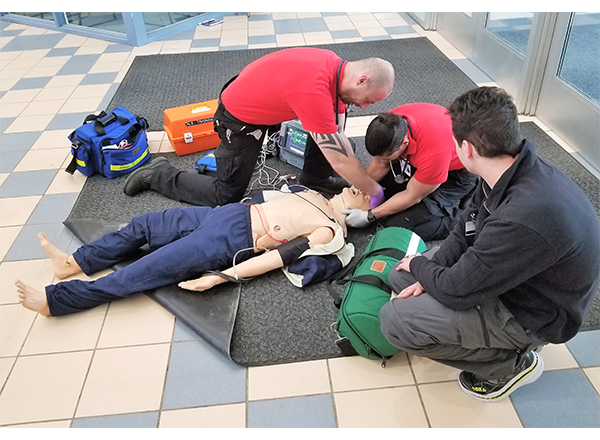 EMS students need to instinctively know where various tools and equipment are located within an ambulance, as well as adapt to working in an ambulance’s confined space. Quick, accurate decisions by EMS professionals can mean life or death for a patient. During labs, EMS students at HFC must respond to simulated 911 calls from around campus. When they arrive on the scene of a simulated 911 call, they quickly assess the medical emergency and figure out how best to assist “Kelly,” a high-tech human patient simulator who seems to be very accident-prone. They treat Kelly on the spot and then transport him/her back to the lab, just as if they were transporting an actual patient to the hospital. 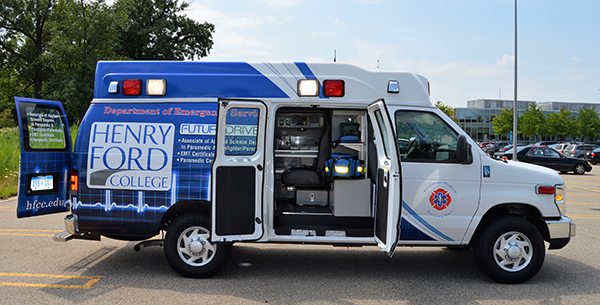 EMS students and faculty often participate in campus events and bring the ambulance when it’s appropriate. At these events, the ambulance is open for community members to tour. 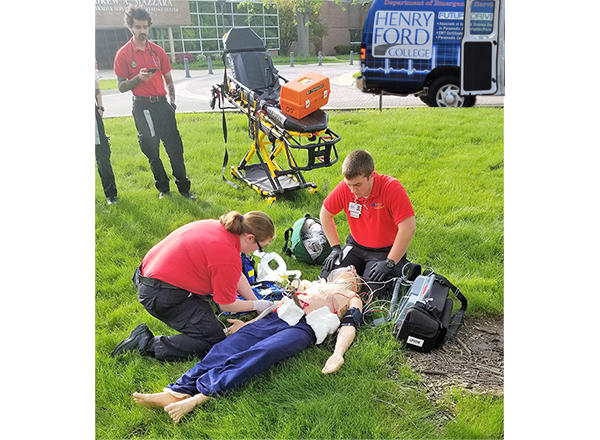 In some cases, EMS students perform demonstrations on people, placing them on a stretcher, strapping them in for a ride, or assessing their vital signs (heart rate, blood pressure, pulse check). “It’s really fun to be in an ambulance when you’re curious about it and you can see how it works instead of actually needing to be in one for medical reasons,” said Bruley. The EMS program is currently enrolling students for this exciting, life-saving career path. 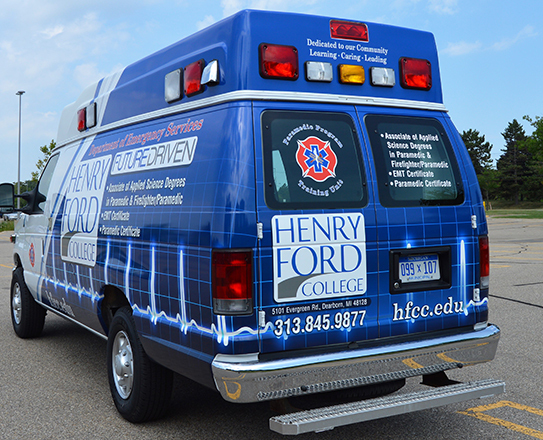 For further information about the EMS program, contact Bruley at 313-317-6582 or sbruley@hfcc.edu. HFC EMS students assist Kelly, a human patient simulator. The HFC ambulance from the side. 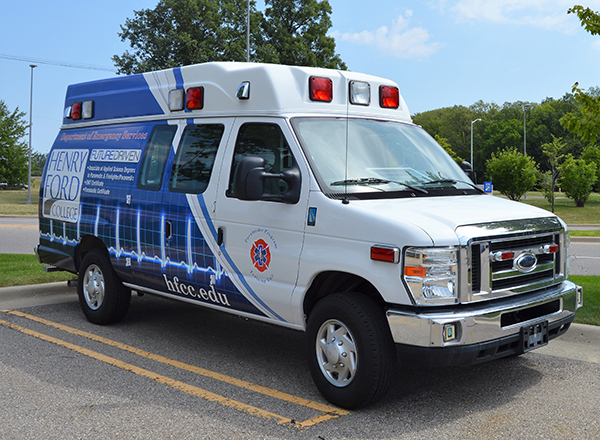 The HFC ambulance gets all-new graphics. 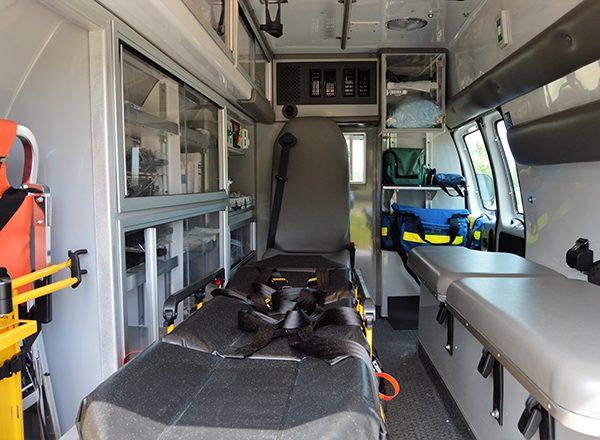 The interior of the ambulance is exactly what students will see on the job. The rear and sides of the ambulance list the EMS programs available at HFC.